Fruity floats, gigantic citrus creations, fabulous flowers. 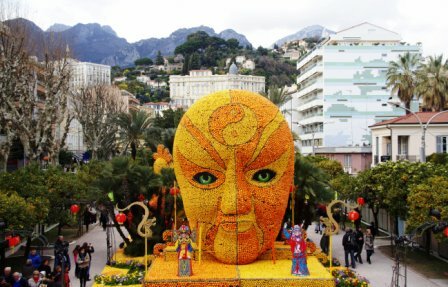 The annual Menton Lemon Festival (Fête du Citron) is an explosion of color, scents, and scenes in honor of the city’s prized small yellow fruit. 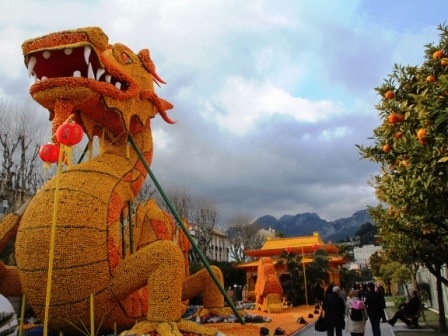 We were enthralled with it all during a visit many years ago, and returned a few weeks ago to survey the scene of dazzling orange and yellow sculptures once again. 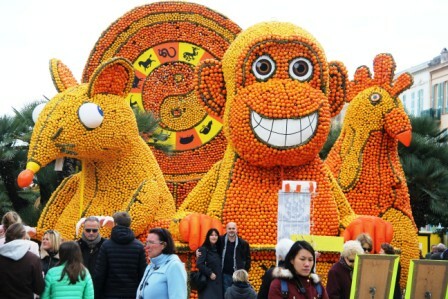 This Riviera city, the lemon capital of France on the border with Italy, has been celebrating the lemon with festivities every year since 1929. 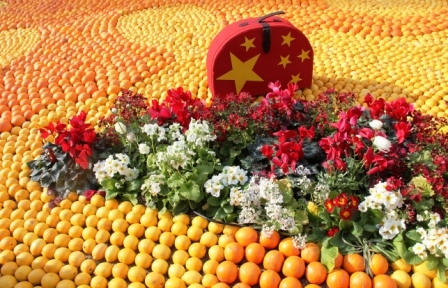 The festival attracts some 230,000 visitors who come to admire 145 tons of citrus fruits which make up the creations and exhibitions. 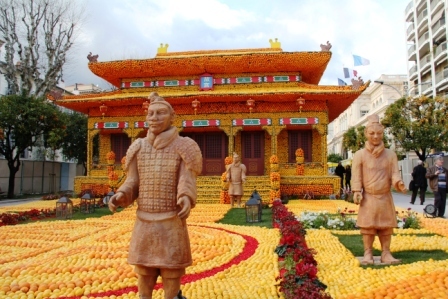 This year’s theme, the lemon in China, featured a mammoth dragon, a pagoda, a temple, animals and more all made of lemons and oranges. The exhibits are set up along the Jardin Biovès, a long promenade lined with the colossal fruit constructions. An elevated ramp in the middle is especially popular with the camera crowd who line the steps for overall shots of the scene. Stands selling the fruit, citrus liqueurs, soaps, jams and postcards do a brisk business. 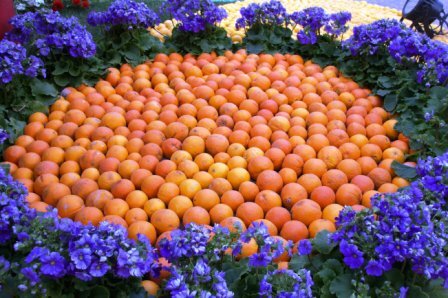 Menton’s microclimate with more than 300 sunny, temperate days per year is ideal for growing the tangy fruit. There are some 80 varieties of lemons, but it’s the Menton lemon that is prized by chefs for its perfume, distinctly flavored zest and pulp, and high sugar content. 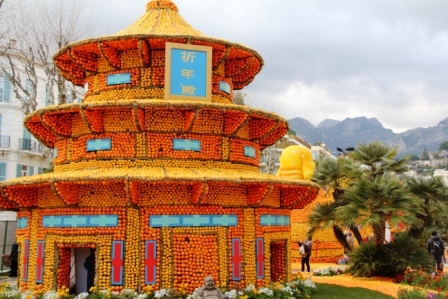 While the lemon gets top billing, oranges play a leading role in the gigantic creations. 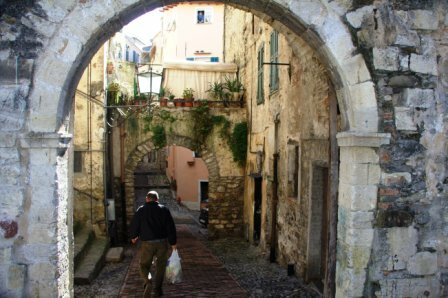 We had previously visited Menton, my favorite coastal city, in January. 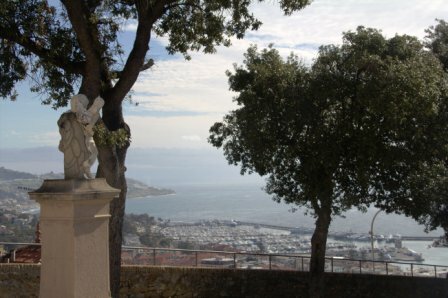 See post, “French Riviera: Magnifico Menton.” The city, which was originally part of Italy, became the property of Charles Grimaldi, Lord of Monaco, in 1346. In 1848 it broke away from Monaco, becoming a free city, and in 1860 it became part of France. By the late 19th century it was on the map as a popular tourist spot on the French Riviera. 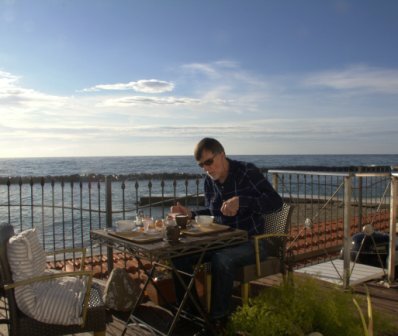 This time instead of staying in Menton, we crossed the border and spent three nights in Sanremo on the Italian Riviera. 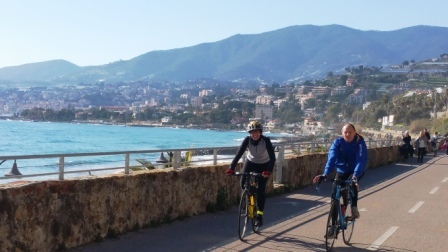 It’s just a 45 minute drive from Menton, and a lovely town on a coastal bike path. That was our plan – get back on the bikes. 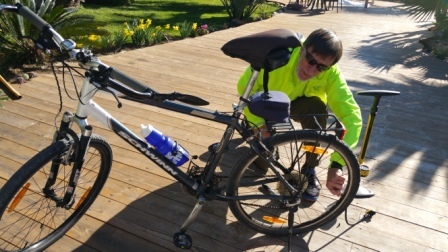 Husband, formerly known as Bicycle Bob (BB), was an avid cyclist. He seems to have lost interest in pedaling, even though he invested in a snazzy, expensive bicycle a few years ago. His passion has become wine, so I call him VR (Vino Roberto). I miss biking and the great rides we have taken over the years — in Switzerland, Austria, Germany, Holland and France. Let’s not give in to old age. Let’s get moving again. He agreed and we had a wonderful, easy ride on the bike route from Sanremo to San Lorenzo al Mare, about 18 kilometers, then back to Sanremo and another 4 kilometers in the other direction to Ospedaletti. Old railroad tracks were converted into the wide coastal trail, used by walkers and roller bladers as well as bicyclists. It meanders through Sanremo then down the coast. No hills. No need to downshift. There are plenty of spots along the route complete with benches where you can rest and enjoy the scenery. And villages (Bussana, Arma di Taggia, Santo Stefano al Mare) for a refreshment stopover. We had a fantastic and bargain lunch at Café Emy by the beach in San Lorenzo al Mare. The insalata frutti di mare (seafood salad) was huge – a meal in itself. 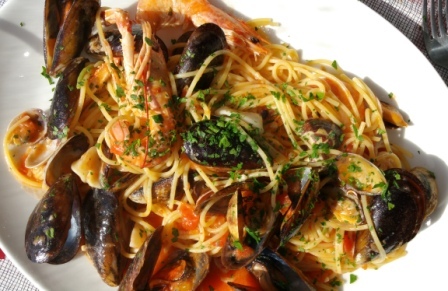 My spaghetti frutti di mare was the best I have ever eaten (see photo). 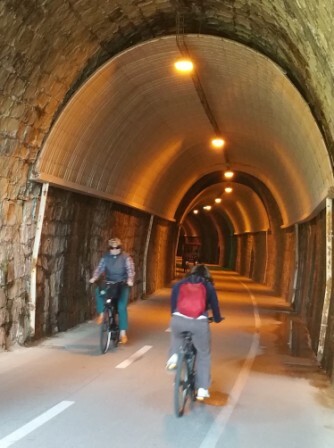 A unique aspect to this bike route is tunnels – several. 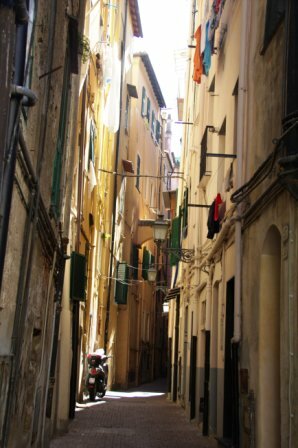 The most famous and longest is the Capo Nero tunnel along the section Sanremo-Ospedaletti, 1.75 kilometers long. It has been converted into a memorial of sorts to Sanremo’s most famous sporting event, the cycling classic Milan-Sanremo. For more than 100 years, the race has been the first important contest of the cycling season. It will take place on March 22 this year. Every bay of the tunnel is dedicated to a specific year in the history of the race, with some basic facts about that year’s event written on one side, with tidbits and anecdotes on the other, in both Italian and English. I was too busy pedaling to read it all, but did try to catch some phrases to break up the monotony of the dismal tunnel trek. Total ride: 45 kilometers. It was a success. And, so was the hotel where we stayed. Fabulous. With just four rooms, the Villa Rita can’t really be called a hotel. The house sits just above the beach within walking distance of the town center. Our room had a large terrace and lovely views. I was in heaven, lying in bed, enjoying the sea view from the window while listening to the restful sounds of waves slapping the shore — and contemplating future bike rides. Menton Lemon Festival: www.fete-du-citron.com/ The festival takes place the last two weeks of February. Like my blog? Tell your friends. Feedback is most welcome. Leave a Reply below. I’ve wanted to get to San Remo and now I have the excuse! and the bike trails sound fabulous…we have friends who have an apartment there and can’t stop raving! I love the idea of the lemon festival and your description and pictures were perfect….now if you could only add olfactory to your blog! Your friends have reason to rave. 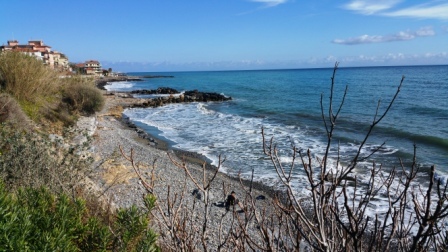 Sanremo and the coast are tops, as is the bike trail. Plan a visit soon. Thanks for your comment. And, yes, the lemons are fun. Your Menton weekend description and photos were so joyful and has caused me to start my day with a smile on my face. Beautiufl! The festival looked truly fabulous, as did the food. As I look at the bleak winter “scenery” here in Haute Provence, I realize that I need more color and zest in my life (Fortunately, spring is almost here) and I appreciate getting it vicariously through you and your energy! Yes, joy and color are plentiful on the Riviera, but all headed our way as spring is on our doorstep. Thank you, Lynne, my all-time number one blog fan! You are terrific. 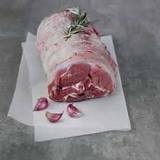 Merci..
Hi Leah, Ag SFO now on way to Heathrow. LOVED the Menton description…cannot wait to take bikes over there. We get home late Weds. nite and will be zoombies I am sure. Going British Air and at check in the gal said that the flight is quite open so would be great if we had some room. Will check in soonest. bot to proceed to gate now. Hugs to you both, G.
Hi Jane. Lemons were lovely, and same with bikes. Yes, we must stay back in the saddle and continue pedaling. Thanks for sharing your thoughts. My hopes are up. Don’t let me down. HOLD THE PHONE! Maybe this ride and a shorter one we did locally since our return signals a change. Maybe. What a beautiful bike ride. Keep cycling it will keep you moving. That’s the plan…more bike rides. I hope you are on the move. Thanks Gayle. Look forward to your news soon. And yes, it’s all marvelous. Knowing marvelous Menton is waiting, jet lag will dissolve much faster, I’m sure–thank you so much, Leah! I really enjoy your blog. I would love to follow this route someday! Hi Stew. I am delighted you like my blog. Do plan to follow the route –and visit us. We can ride together. Love, Cousin Leah. Wow thanks reading about your travels takes me there! Thank you. That’s the best feedback. Makes my day. I can almost smell those lemons right now – sounds beautiful! It’s a spectacle and well worth a visit — next year. Thanks for the comment. Once again, you have outdone yourself! Your writing and photography are enough to get any couch potato up and moving! Maybe we can join you on your next outing. I would love to do that route, all of it, from the cycling – which is how we met those many years ago – to the pasta Frutti di Mare and the room at Villa Rita! Best wishes to you and BB/VR. Thanks Noel. Let’s ride it together. Not quite as challenging as the Bodensee, but no doubt tastier. We’ll be in touch.